If you want to go to a formal party and are bored of wearing the same suit over and over again, you can give your same old suit a different look by cufflinks. Cufflinks complete the look and give elegance to the dressing of the man. Not many prefer to wear cufflinks though; they find it way too absurd and easy to loose. Following the same old traditional buttons is better they feel. Everybody doesn’t think so. There are people across the globe that prefers opting for the most expensive piece of jewellery to give their look a finishing touch. Well the world’s most expensive cufflinks are given below that hold class and style without looking gaudy. The cufflink is designed by Jacob & Co. It is designed in the most elegant way giving it a formal look with minimum fashion. The design enhances the beauty of the square 10.5 carat yellow canary diamond. Set atop a 14k white gold frame gives the cufflink a perfect finish. An oval-shaped flip-back latch is an additional feature designed in the cufflink. This cufflinks features a crown in golden and is decked with sapphires and diamonds that are aid on the double sword base made in yellow and white gold. Featuring a golden crown decked with sapphires and diamonds lay on top of a striking double sword base made from 18-carat yellow and white gold. Only seven V2’s were designed by Arfaq Hussain. Micheal Jackson is its most famous buyer and wore it during History World Tour. The usage of two tones in the cufflinks design makes it ideal to stand out of the crowd in a meeting. 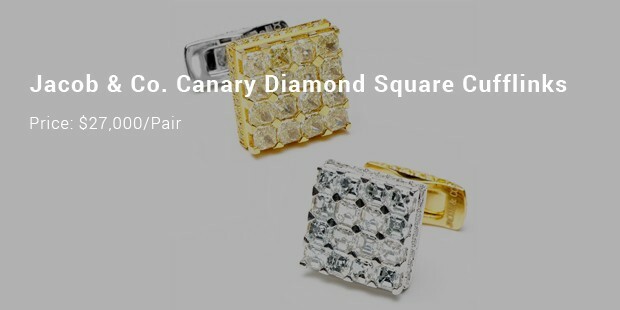 The elaborated cubic designs use white and yellow canary diamonds, each piece weighing a total of 3.44 carats. Pairing these cufflinks with dark colored jackets will surely turn heads around. 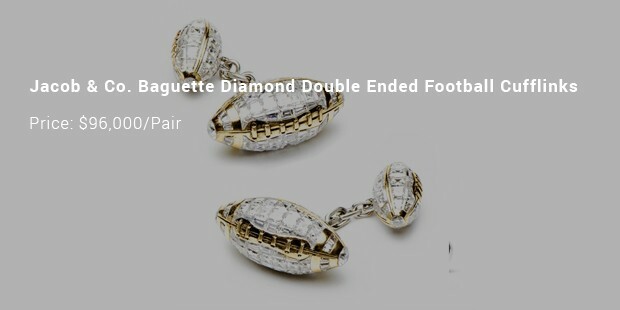 A jewelry company was founded by Foundrie which launched its brand of cufflinks in 2011. 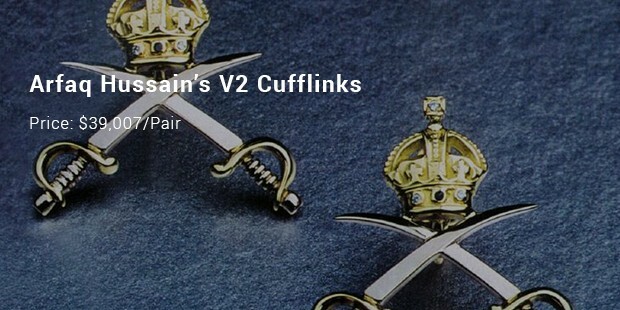 The cufflink was named after the rifle AK47 range. The company later teamed up with James de Givenchy and produced Phoenix Collection was inspired by the concept of the egg as a symbol of budding possibility. The cufflinks have a rose pedestal base made of 120 AK47 steel. 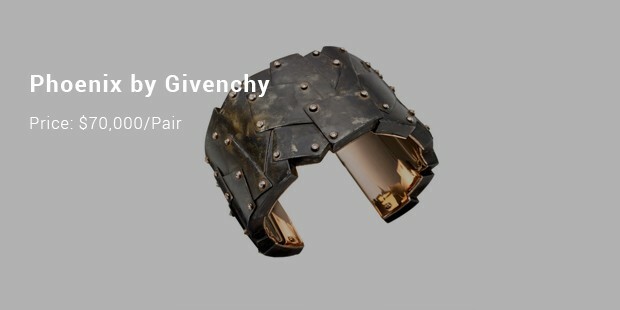 It is adorned with diamonds and 18k gold coating. 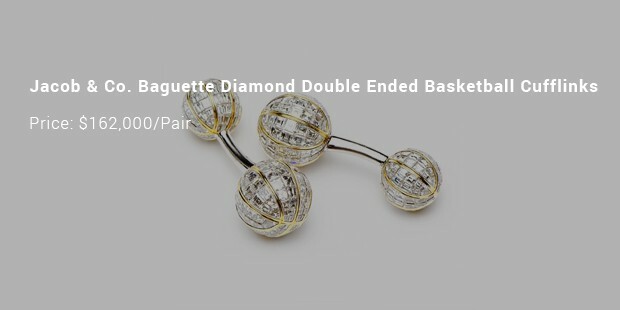 This design contradicts the perfect symmetry of diamonds. The diamonds are placed in a pentagonal layer of 18 carat white gold. 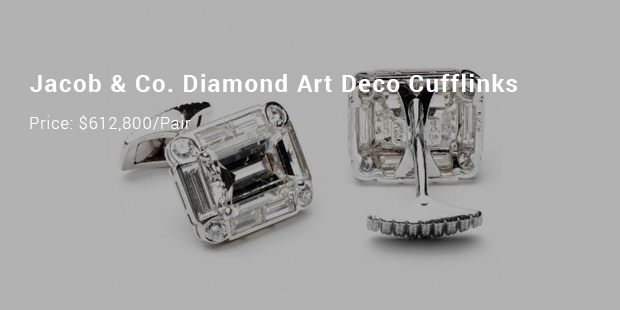 A total of 10 carats worth of diamond is combined to give the cufflink a rich and modest appearnace. This design is considered to be one of the most exquisite forms of expression. It measures a total of 15 carats. An addition of an 18-carat yellow gold trimming gives this cufflink grandiosity. A total of 22.73 carats of white diamonds are designed to adorn four spherical cuffs. A two tone trimming of white and yellow gold is bound to turn heads. 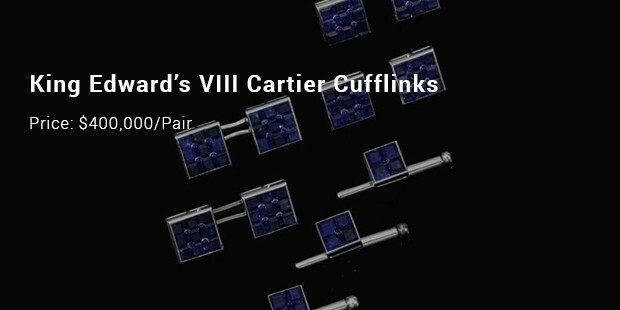 These cufflinks were gifted to King Edward VIII (1894-1972) by his commoner American wife, Wallis Simpson (1896-1986). There love story remains as one of the greatest love stories in the history of this century. During n auction in 1987, this pair of diamond cufflinks was sold.The cufflinks are believed to be imprinted with the phrase”Hold Tight”. 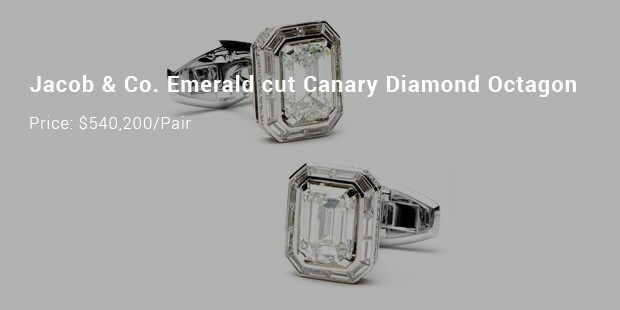 The central diamond used in this cufflink is 10.76 carat. There by resulting in giving the gloriously magnificent, yellow Cape diamonds breathe taking look. 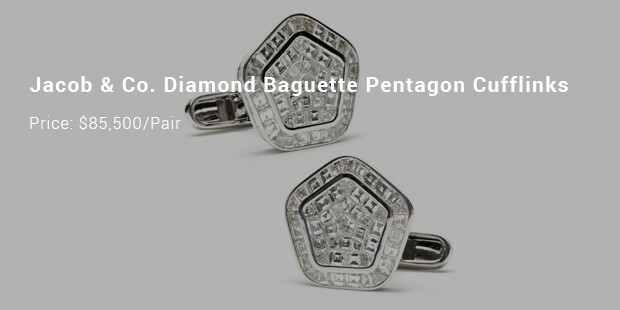 This designed cufflink has two white 6.05 and 5.90 carat diamonds encircled by smaller diamonds weighing a total of 4.52 carats. These diamonds lay on an 18 karat white gold frame. Surely who said diamonds were are a woman’s best friends. Diamonds are equally closer to a man giving him a stylish look with a tinge of class and elegance.